There's nothing I love more than curling up on my couch with my favorite blanket. A Carolina Patchworks quilt by Emily would be a perfect match to a nice cup of tea and one of my favorite magazines! Who doesn't like shopping? I can easily spend hours at my favorite shop. This quilt is absolutely beautiful and I can just picture all the awesome snuggling that could be done by a nice warm fire in the winter.....with this quilt! oh, i love quilts and this one is a beauty. i can handle everything up to the quilting part though. that takes perseverance, but makes all the difference in the world. thank you for sharing her process. 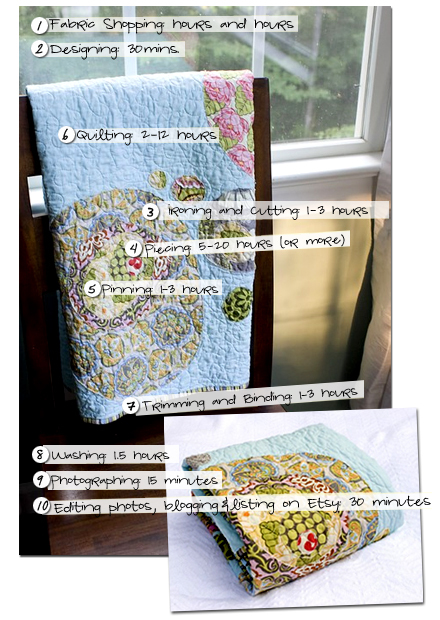 This description of quilting cracked me up! So clever.